After several months of attending events on the USA'S west coast, the Kenda truck and trailer will be making a swing to the east coast. First up is the Pedro's Festival (www.pedrosfest.com) in Hancock, MA, July 13 - 15. 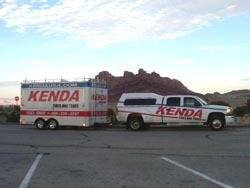 This is the Festival's 13th year and Kenda has been a long-time sponsor of the event. The following week we'll be at the USA Cycling National Mountain Bike Championships (www.mountsnow.com/mtbike) in Mt. Snow, Vermont. Kenda is also a sponsor of this event. Look for the Kenda X-Fusion Titus Team to be there in full force. Next, Kenda travels to the NMBS Mountain Bike Race (www.mtbnationals.com) at Sugar Mountain, NC., July 26-29 Again, Kenda is a sponsor of the race series. At each event, Kenda will make available 17 demo bikes for test-riding Kenda tires. Plus, we'll have super deals on tires, tubes, jerseys, shorts and other products. In addition, get a free cold can of Full Throttle or Tab Energy Drink at each event. Since 1962, Kenda USA has been designing and producing quality bicycle tires and tubes for riders of all ages all over the world. Kenda offers a wide variety of tire patterns and sizes for Mountain, BMX, Juvenile, Road and Comfort bicycles. In addition, researchers are constantly working with new materials and technologies in efforts to increase the performance and reliability of all Kenda products. To learn more, go to www.kendausa.com.